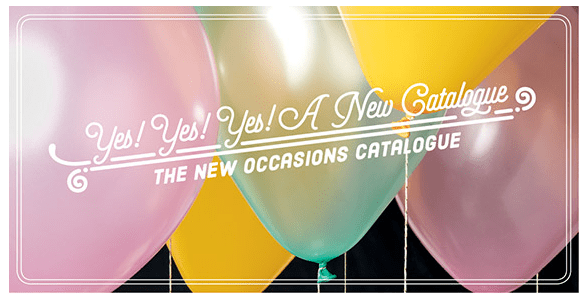 New Catalogue & Sale-A-Bration Start NOW! Sing it with me – “It’s the most, wonderful time, of the year!” 🙂 Okay, that may have been taken from a Christmas song (or a commercial) but it’s true – it’s one of the best times of the year, topped only by the release of the Annual Catalogue in June! TODAY is the day you, my dear customer, can start placing your orders for the newest products from Stampin’ Up!, all featured in the new Occasions Catalogue! If you haven’t received your catalogue from me, and would like one, just shoot me an email (click on the Contact Deb button in the side bar) debsmart@shaw.ca , and I’ll take care of that for you. Of course, you won’t want to wait to see all the amazing goodness in the catalogue – to have a look online, CLICK HERE to open the PDF file. 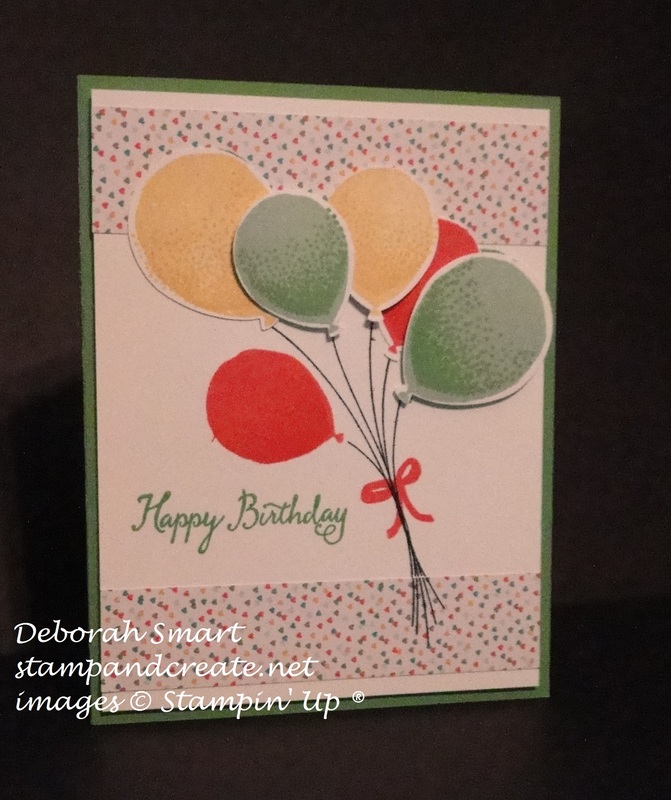 Here’s a look at one of my favourite bundles in this catalogue – it’s the Balloon Celebration Stamp Set and Balloon Bouquet Punch (bundle #140810); these are 2 of the cards I made with this bundle, and I’ve only just started playing with it! What goes well with a new catalogue? How about FREE PRODUCTS?! I told you – the most wonderful time of the year!! Seriously – who doesn’t like FREE (it’s my favourite price!). To browse the Sale-A-Bration brochure online, CLICK HERE. Here’s the deal: for every $60 you spend (before tax and shipping), you get a FREE Sale-A-Bration product. That means it’s the perfect time to purchase those products you’ve had your eye on while earning more products for free. Click the ‘Shop’ button above to go directly to my online store! Note: Pages 4-15 of the Sale-A-Bration brochure show products available throughout the entire Sale-A-Bration sales period (January 5-March 31 2016); Pages 16-19 show limited-time products available only until February 15. * Watch for another batch of limited-time products coming February 16! *Based on inventory, availability may be temporarily extended. Need another excuse to get together with friends? 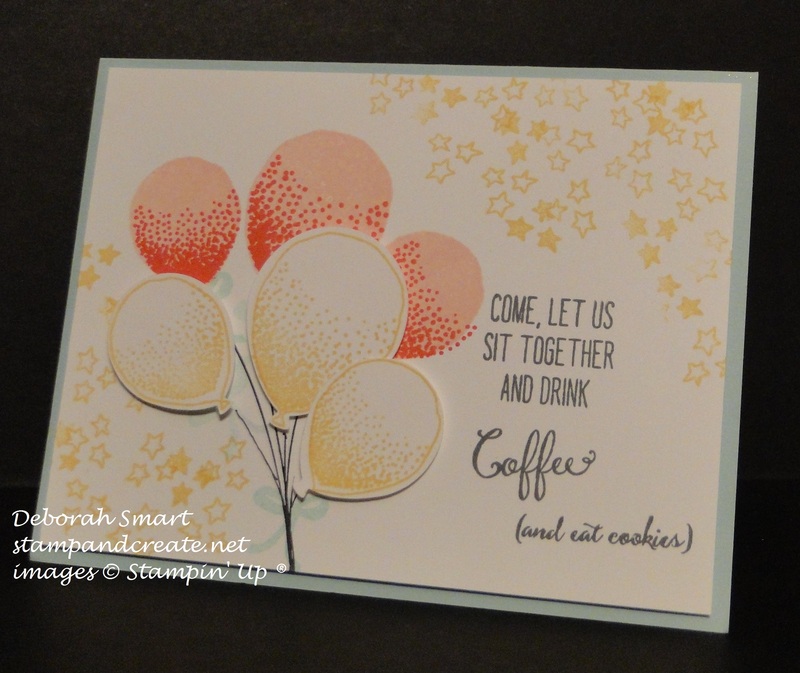 Just host a qualifying party with at least $330 in sales during Sale-A-Bration and you’ll earn $35 more in Stampin’ Rewards! You can even apply your Stampin’ Rewards toward a Starter Kit and become a demonstrator yourself! To book your party or private card class, contact me at either debsmart@shaw.ca, or call me at 604.298.0472 – hurry for best dates available! It’s the best time of year to join Stampin’ Up! During Sale-A-Bration, you can become a demonstrator for just $125 and choose $40 more of FREE products for your Starter Kit. Plus, the kit ships for free! To recap: here are the links to viewing the catalogues online; OCCASIONS CATALOGUE, SALE-A-BRATION BROCHURE. To BOOK YOUR PARTY, simply contact me either by email at debsmart@shaw.ca, or telephone at 604.298.0472. I can’t wait to talk to you about making the most of Sale-A-Bration, earning your FREE products, and the great opportunity of joining my Team! Previous Previous post: Blogging Friends Blog Hop – Happy New Year!